By Justin Wier | October 11, 2017 at 12:05a.m. At a special meeting Tuesday called to decide whether to approve or deny the annexation of 18.83 acres in Canfield Township to Canfield city, Mahoning County commissioners decided to delay that decision until Oct. 26. A lawsuit filed last week on behalf of local televangelist and developer Frank Amedia asked a judge to compel the commissioners to rule on the annexation. Amedia’s attorney agreed Monday to give the commissioners 16 days – until their regular meeting Oct. 26. In that time, Amedia wants to have a work session with Canfield city and township officials in hopes that the entities will approve a memorandum of understanding to form a joint economic development district encompassing the property Amedia wishes to annex. Amedia has plans to develop the property near U.S. Route 224 and South Palmyra Road commercially and residentially. 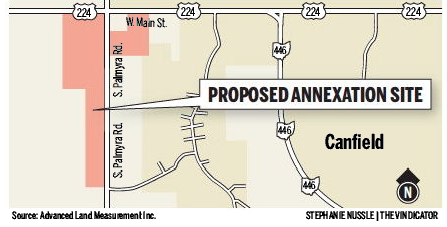 Annexation would provide access to city water and sewer lines. The developer called Tuesday’s decision fair and equitable. Petitioners filed for annexation June 2. State law requires commissioners to rule between 30 and 45 days after a petition is filed. Amedia has agreed to three previous delays. A decision made by the commissioners Sept. 26 to delay the ruling an additional 60 days prompted the lawsuit. Amedia argued the delays have, through no fault of his own, resulted in a failure to meet commitments and cost his partners and himself time and money. Canfield Township Trustee Marie Cartwright said the township and city are “conceptually” in agreement on a JEDD, but need a development and infrastructure plan from Amedia. “Moving all the property at one time instead of going back and forth is in everybody’s best interest,” Cartwright said. The current annexation involves 18.83 acres, but Jim Tadla, who represents Amedia, said Amedia plans to develop 111 acres of township property. State law requires the territory being annexed to have a perimeter no more than 20 times the length of the area where the territory to be annexed borders the city. The proposed annexation currently abuts the city along 311 feet. “[Amedia’s] got to come back to you again and again, and we have to have these discussions again and again,” Cartwright said to commissioners. However, Tadla said the current annexation will provide a large enough border that moving the rest of the property into the city would only require one additional annexation. October 27, 2017 12:04 a.m.
October 26, 2017 9:55 p.m.
October 26, 2017 11:37 a.m.
October 10, 2017 10:04 a.m.